Here you can watch in real time as some of Dr Ben Goldacre’s BadScience Internet forum members agree together to engage across the internet in what will likely be their usual formula of personal abuse, disparagement, harassment and defamation. So having been told to shut up on Dr Ben Goldacre’s BadScience Forum, they are being told it is OK to go onto their own blogs where they will no doubt engage in Google bombing the internet about this. The CHS article above is about just one suicide linked to the internet activities of some of the members of Dr Ben Goldacre’s BadScience Forum. It is not the only suicide of an individual subjected to years of relentless internet attacks by some of Dr Ben Goldacre’s BadScience Forum members. The article exposes what Dr Ben Goldacre has been allowing on his BadScience internet forum for years – very serious organised orchestrated internet bullying, abuse, disparagement, harassment and defamation on an internet wide scale against individuals who have differing perspectives from his members and associates. Additionally, it is clear from this and other evidence that Dr Ben Goldacre is allowing his BadScience forum to be used in this manner. He has had previous warnings which are documented. Harassment whether on the internet or elsewhere is apparently illegal and can attract stiff penalties following laws introduced to the UK to counter serious problems of stalking and harassment of celebrities and private individuals. And this clearly has the look of the usual orchestrated harassment by agreement which under wholly separate legal provisions CHS understands can also be unlawful and attract stiff penalties. Or should Dr Goldacre be exempt from acting responsibly or above the law? The BadScience Forum webpage linked to above keeps changing and some comments have been removed already and some are still being added. Please be very careful in discussing this not to stray into anything that will be problematic, thank you. Further to this: I was a bit worried we hadn’t been quite careful enough, so I’ve quarantined a couple of posts. I might be being overcautious. I’ll ask the other mods to take a look at teh quarantined posts. I apologise for inadvertently posting about this. I didn’t realise what was going on (but I have since received PMs from three people explaining the situation). andysnat wrote: It has nothing to do with legal, and plenty to do with keeping the forum.Thanks. This. Anybody feel free to PM me for discussion of the background to this situation. As ever, we thoroughly encourage people to write about this on their own blogs. Backstep wrote: Dear mods, I love you all dearly, but hows about you don’t encourage us to p.ssy foot around this topic? As long as comments are legal is there any thing else we need to take into account? Backstep wrote: As long as comments are legal is there any thing else we need to take into account? Yes, there is. The last time this came up it was almost the end of this forum. Personally, I like it here, and I don’t want it to become more trouble to the curly-haired one than it’s worth. I think we should take the advice previously given, and repeated by duck, that if we want to address the issues raised we should take it to our own blogs. A patient committed suicide after an anonymous malicious complaint was made by Stuart Jones to the UK’s General Medical Council about the patient’s treating physician, a disciplinary tribunal was told. Stuart Jones [Registration Number: CS17316] was at the time a member of Dr Ben Goldacre’s BadScience Forum and was a clinical scientist at the Queens Hospital, Romford, UK. The physician concerned sometimes employed treatment methods which were not those conventionally employed by others but which apparently reaped benefits for patients. The patient, who was suffering with chronic fatigue syndrome at the time [also known as ME] killed himself, according to evidence from his doctor, because he mistakenly believed his doctor was no longer allowed to treat him: ‘Deluded quack’ jibe nearly ruined doctor’s career, Daily Telegraph, 21 December 2011. Members of Dr Ben Goldacre’s Badscience Forum are encouraged by Dr Ben Goldacre to take direct action and get involved. This has included some members launching online attacks on medical professionals who employ treatment modalities others in mainstream medicine do not. BadScience Forum members are also encouraged to make complaints to a large number of regulatory bodies all the time. Dr Ben Goldacre has practised as a psychiatrist and is a columnist for the UK’s Guardian newspaper where his column, which appears infrequently now, is devoted to what he calls BadScience. Stuart Jones’ complaint resulted in the temporary suspension by the GMC of the patient’s doctor. The GMC prosecution of the deceased patient’s treating doctor was dropped abruptly by the GMC. By 22nd August 2011 the GMC advised the Doctor all charges had been dropped – [see chonology at end of this article]. Stuart Jones was in turn prosecuted by the Health and Care Professions Council. He was subjected to a very minor punishment of merely a two-year Caution Order. The two year caution order was imposed in December 2011 but will remain on the register until 18th January this year. Between 1st March 2009 and 26th October 2010 Stuart Jones, posting anonymously on Dr Ben Goldacre’s BadScience Forum as “Jonas“, made numerous disparaging remarks about the patient’s treating physician. The career of the patient’s doctor was nearly destroyed in addition to the patient taking his own life in despair at the thought of not getting effective treatment after Stuart Jones described the patient’s doctor as a ‘deluded, pill-peddling quack’ the disciplinary tribunal hearing was told. Stuart Jones also wrote on the BadScience website that the patient’s doctor, who specialises in treating chronic fatigue syndrome, “lulled patients into a dangerous world of make-believe pseudo-science”. The Health Professions Council heard evidence that Jones’ messages were “defamatory, derogatory and disparaging” and had a detrimental effect on the doctor’s professional and personal life. Dr Ben Goldacre’s BadScience Forum was flooded with 10,000 posts responding to Jones’ initial message in April 2010. Causing a patient to commit suicide by vicious bullying of the patient’s treating doctor specifically to “increase anxiety levels” in the victim doctor’s patients is apparently not a sufficiently serious crime to warrant more than a 2 year “caution” for the Health and Care Professions Council. Although no charges were brought against the patient’s doctor by the GMC and the doctor was never called before the GMC, aborted investigations in 2006/07 cost the GMC £136,692.12 in solicitors’ fees and disbursements and a possible further £500,000 on internal costs – according to a report on a website set up to support the patient’s doctor by patients and wellwishers. The GMC is funded by a levy paid by all medical doctors registered in the UK. It appears also no action has been taken by the GMC regarding Dr Goldacre’s BadScience Forum activities. Monday to Friday – 8am to 6pm – Saturday – 9am to 5pm – UK Time. CHRONOLOGY [6 Jan 2014]: This is a chronology of some of what the poor doctor has had to face at the hands of the General Medical Council. Compare what follows with the case of Dr Jane Barton. With Barton the police investigated 92 deaths over 12 years [no criminal charges were brought]. An inquest found ten of 12 deaths followed excessive doses of morphine. Dr Barton was neither struck off nor suspended but simply had restrictions to prescribe certain drugs imposed on her. This GMC decision came on January 29th 2010. Remember at all times that no patient was harmed. Patients benefited and praised the Doctor and none were put at risk. Nov 2002: five day GMC fitness to practice hearing scheduled to take place. Five complaints only from doctors, none from patients. No patient harmed, put at risk, nor any malpractice. Complaints objected to doctor’s style of practice and the allergy, environmental, nutritional approach to medicine. Oct 2002: hearing postponed to Feb 2003 and extended 8 days for eight complaints. Jan 2003: Feb hearing cancelled – no proper explanation. Hearing was cancelled because at least one allegation was fabricated, one based on untrue facts and patients had refused to co-operate. April 2007: new set of allegations & new hearing proposed. Again, includes complaints only from doctors and who do not like the style of practice. No patient harmed or put at risk. Now extended also to complaints about website. July 2007: 10 day General Medical Council (GMC) fitness to practice hearing scheduled to take place Sept 2007. That hearing later postponed and proposed as a thirteen day hearing in February 2008. Oct 2007: GMC drop all charges. Aug 2009: Aug 12th GMC had been found out removing documentary evidence supporting the accused Doctor. Apr 2010: Apr 2nd anonymous complaint received from GMC by Doctor [complaint from Stuart Jones]. April 2010: Thurs 8th April GMC orders Doctor to attend “Interim Orders Panel” for following Monday 12th April. IOP is to make no decision about validity of complaint – an “interim” hearing only. April 2010: April 9th – hearing postponed to April 29th. Dec 2011: Over 1 1/2 years later yet another IOP hearing. Jan 2011: Temporary suspension lifted. Aug 2011: 1st Aug all sanctions lifted. Aug 2011: 22nd Aug all charges dropped. GMC cancels Fitness to Practice Hearing [scheduled for November 2011] and advises there is no case to answer. Dr reinstated on the General Medical Council Register. Dec 2011: 20th Dec Stuart Jones found guilty by HCPC. Dr Hr stated that he did not consider that you were acting inappropriately although he considered that your reference to ‘dangerous medicine’ was inappropriate. He added the caveat that you should ensure that the information given should be accurate and not alarmist. Overall, he considered that your actions were appropriate and of a reasonable competent standard. So the GMC commissioned two more experts to address the website content and they decided it was not appropriate. Instead of being struck from the medical register the Dr was given a “warning”. You know about how individuals gain control of the power of the State and then abuse that power like former US President George “Dubya” Bush? “Dubya” started a war in Iraq which was highly profitable for some US businesses. He achieved this by claiming Iraq had a nuclear weapons programme which was a serious world security threat when Iraq did not and when it had already been bombed into oblivion by the war his Dad George Bush Snr waged on Iraq in 1992: Valerie Plame Wilson: the housewife CIA spy who was ‘fair game’ for Bush UK The Telegraph By Chrissy Iley 15 Feb 2011. Remember how Bush was supported by UK Premier Tony Blair who helped by persuading the British Parliament to join the US with faked “intelligence” of Iraq’s weapons of mass destruction which did not exist but which Blair claimed could be deployed within 40 minutes and posed a serious security threat? If you remember that then you will know how these kinds of people manipulate the media. Notice how they persuade us we are in imminent danger of some threat or other and that they can save us all if we trust them? This trickery is not new. It had been used for well over a century with smallpox. The myth continues to this day. There was a nasty disease called smallpox and it did kill people long ago. This was especially the case when the poor moved to the cities during the industrial revolution looking for work and choked them in overcrowded unsanitary slums ripe for breeding and spreading disease: London’s first park built after rich feared disease spread from slums UK The Independent By Andy McSmith Friday 07 November 2008; Hygiene History in the Industrialized World. The middle and upper classes needed to be reassured the State would keep them safe from the threat of disease. The majority of the population of entire countries were persuaded their States could achieve this by ensuring the then truly “great unwashed” masses would be vaccinated and the disease controlled. The trouble was this was a myth but the people wanted to believe and were persuaded. Smallpox vaccination did not work and sometimes killed as many or more than the disease itself whilst many of the “vaccinated” still contracted the disease: Smallpox Mortality, UK, USA, Sweden. In the graphs below notice the large numbers of deaths caused by the smallpox vaccine itself. By 1901 in the UK, more people died from the smallpox vaccination than from smallpox itself. The severity of the disease dimished with improved living standards and was not vanquished by vaccination, as the medical “consensus” view tells us. Any vaccine which takes 100 years to “work” did not. On any scientific analysis of the history and data, crediting smallpox vaccine for the decline in smallpox appears misplaced. When during 1880-1908 the City of Leicester in England stopped vaccination compared to the rest of the UK and elsewhere, its survival rates soared and smallpox death rates plummeted [see table below]. Leicester’s approach also cost far less. Extracts from “LEICESTER: Sanitation versus Vaccination” By J.T. 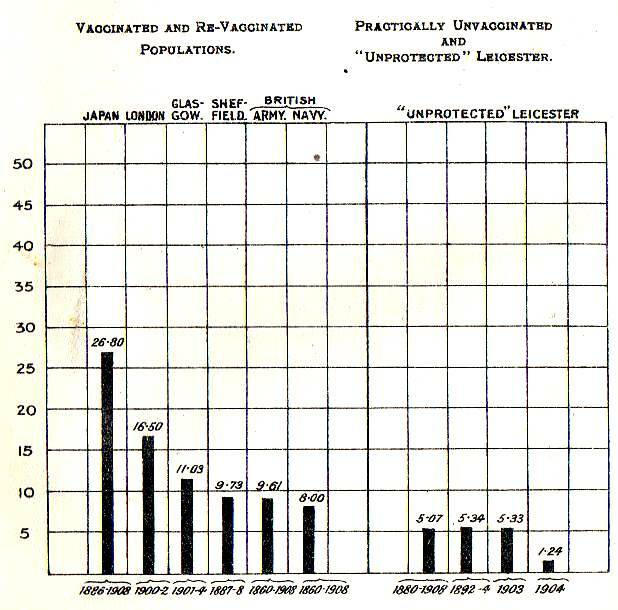 Biggs J.P.
SMALLPOX FATALITY RATES, cases in vaccinated and re-vaccinated populations compared with “unprotected” Leicester – 1860 to 1908. The committee are seeking submissions about this. The closing date has been extended to February 7th, 2014. Ms Dorey states that whether you live in NSW or elsewhere, your opinion will make a difference and that it would be helpful to submit a short 2-3 paragraphs. Consult the terms of reference first set out in full below [and downloadable as a pdf file here]. And of course, if you don’t make submissions, there will be plenty of others who are happy to see health fascism and dumbing down succeed, who will make submissions. Ms Dorey also reports that these recent developments in Australia were foreshadowed by the New South Wales state government in Australia permitting and encouraging hate tactics against AVN which include bullying, threats and intimidation. Those tactics revealed the intent to suppress freedom of speech, inhibit the dissemination of information and thereby to disempower individual Australian citizens from considering issues for themselves to make up their own minds – a basic right in any democratic society. That the quality of politics and standards in public life in Australia are low was highlighted a number of times this year. Australia’s first woman Prime Minister Julia Gillard was told by a radio DJ her long-time male hairdresser partner “must be gay” for being male and a hairdresser. This was in the week after it was reported that a DJ behind last year’s prank call on the hospital of the UK’s mother-to-be Duchess of Cambridge that lead to a nurse’s suicide not only kept his job but won a top award for his stunt as well: DJ is sacked for asking Australian PM Julia Gillard if her boyfriend is gay live on air… because he’s a hairdresser Matt Blake UK’s Daily Mail 14 June 2013. And Stephanie Banister 27 had to withdraw her candidacy for election to the Queensland Australia state Parliament after a TV interview went viral on the internet in August this year. Aside from not knowing names of the candidates she was running against, Ms Banister thought believers in the Jewish religion followed Jesus, that she did not “oppose Islam as a country … “ but felt “their laws should not be welcome here in Australia“, confused the term “haram” [forbidden] with the Islamic religion’s holy book the Qur’an [Koran], and all whilst facing Court charges for allegedly taking part in an anti-Muslim vandalism campaign, in which it was alleged she stuck a sticker reading “Beware! Halal food funds terrorism” on Nestle products at her local Woolworths: ‘I don’t oppose Islam as a country’ – Australian politician withdraws from election after TV immigration gaffe interview goes viral Rob Williams The Independent Saturday 10 August 2013. The case of Stephanie Banister shows how inured the Australian media are to such low standards of politics that the story was not particularly big news until after it was picked up on the internet and went viral. With this kind of international reinforcement of the cliched stereotypical Australian, other Australians who want to shake that image of being descendents of convicts, cultural philistines and animal lovers [ie. sheep] have their work well and truly cut out for them. That the Committee on the Health Care Complaints Commission inquire into and report on possible measures to address the promotion of unscientific health-related information or practice s which may be detrimental to individual or public health. The Inquiry will focus on individuals who are not recognised health practitioners, and organisations that are not recognised health service providers. This entry was posted on December 23, 2013, in Vaccination. Bookmark the permalink. As many of you would know, both the AVN and I were under investigation by the Health Care Complaints Commission (HCCC) in 2009/2010. This investigation was brought about due to two complaints. One was filed by Mr Ken McLeod, a founding member of the hate group Stop the AVN (SAVN). The other complaint was filed by Toni and David McCaffery, parents of Dana McCaffery, a baby who tragically died in 2009. The entire investigation process was most irregular (to say the least – you can read the complaints and the AVN’s responses by clicking this link) and it was clear from the start that the HCCC was acting outside of their jurisdiction. This was confirmed when our tiny, unfunded organisation prevailed against this government body with the deepest of deep pockets in the Supreme Court in 2011. The decision of the court was that the HCCC did not have jurisdiction to either cite or warn against our group – a common-sense outcome which most people in the community who believe in freedom of speech applauded because, no matter what your opinion on the vaccination issue, the majority of thinking Australians would never want to silence debate or discussion on any matter of science. Does the HCCC have the right to stifle political speech? Recently, one of our members sent me an article from a scholarly publication called the Journal of Law and Medicine. In 2012, this journal published an article entitled, Civil Liberties and the Critics of Safe Vaccination: Australian Vaccination Network, Inc v Health Care Complaints Commission (2012) NSWSC 110. This was an article written by someone who wore his strongly pro-vaccination opinion on his sleeve for all to see. Despite this, his conclusion was very interesting and, in retrospect, ironic. What he advised the government not to do is exactly what they ended up doing. The government of NSW went ahead and introduced changes to legislation which specifically target the AVN and anyone who wishes to freely access or discuss both sides of scientific and medical issues. Here is a quote from this article which I wanted to share with you. In my opinion, it speaks to the heart of the matter and why the actions of the current NSW government are dangerous and in direct opposition to the welfare and needs of the people of this State. … Alternatively, Parliament could amend the Act to broaden the definition of “clinical” or “care” or to allow the HCCC to investigate complaints under s 7(1)(b) where there is a mere tendency for the conduct to affect a client. The court even suggested language for such a reform. However, the current authors do not support legislative reform of the HCCC in the manner proposed above or by the court. In a free society, the views and opinions expressed by Ms Dorey and the AVN should be protected against government interference. Arguments against public immunisation programs are not simply debates over health policy; they are also political discussion. As such, the AVN’s website, and Ms Dorey’s statements, are to be protected from interference by Parliament or the Executive by the implied constitutional right of political communication. This is a common sense approach and one that the AVN has been suggesting for years. We have asked for an open and transparent debate in plain view of the public on the relative risks and benefits of vaccination. We have asked the government to remove the hate rhetoric and pressure currently being applied to this issue and bring the conversation back to the realm of scientific evidence and proof. We believe strongly that if the pro-vaccine lobby actually had the evidence on their side, they would be using it to do this. The fact is that both they and the government have permitted and, in some instances, encouraged the same tactics as the hate group, Stop the AVN – of name calling, threats and intimidation. This might indicate that they might be more concerned with suppressing information then they are with enabling the public to examine this issue and make up their own minds – such a basic right in any democratic society! Not long after the AVN won their case in the highest court in the State, the government did exactly what this paper – written by legal experts who believe strongly in the benefits of vaccination and disagree with the information provided by the AVN – advised against. They passed legislation giving the HCCC an obscene amount of power to investigate and cite nearly anyone they choose. And of course, they chose us. These powers were not enough for the HCCC however and the Parliamentary Committee for the Health Care Complaints Commission is now considering passing legislation which will make everyone in the community – especially those who practice and use natural therapies, liable to government sanctions for merely DISCUSSING any issues which are not to mainstream medicine’s liking publicly. The committee are seeking submissions from the public about this. The AVN has made a submission on behalf of our membership, but it would be incredibly helpful if everyone reading this would also write a short (2-3 paragraphs is enough and you can read the terms of reference at the Commission link above) submission of your own. The original closing date for this Inquiry was November 30th, 2013 but that has now been extended until February 7th, 2014. This is a rare opportunity to have your say on this vital issue and whether you live in NSW or elsewhere, your opinion will make a difference. Why should you care about this issue? Why should even those who are opposed to the AVN give a damn about laws that are proposed to target our organisation? Imagine the joy of some politicians or anyone else with an axe to grind who, in passing restrictive or unpopular legislation, can point to this precedent and say – nobody is allowed to criticise X-Y-Z policy because it is against the public interest and therefore, you will be gagged if you speak out against it. This is the power the government has given to the HCCC. And you should be aware of this. And you should be afraid of allowing it to stand. It is time for the silent majority – those Australians who support freedom and oppose invasive and oppressive government policies, to speak up by writing a submission – it need only be short – to the HCCC Committee. Today, vaccination sceptics are the target. Tomorrow it may be the government targeting families that home school; or those who feed their children organic food. We must all stand together for freedom and for our inalienable human rights. No government should ever be allowed to take them away for us. Please note: Blog posts are opinion pieces which represent the views of the authors. They do not necessarily represent the viewpoints of the AVN National Committee. The AVN is a forum, support and information organisation and outlet for discussion about the relative benefits and risks of vaccinations in particular – and medical procedures in general. We do not provide medical advice but believe that everyone has the opportunity and the obligation to do their own research before making decisions for their families. The information we provide (including your personal review of the references we cite) should be taken in conjunction with a range of other data, including that obtained from government, your health care provider and/or other medical source material to assist you in developing the knowledge required to make informed health choices. Fox News in the US is breaking the “news” that autism, inflammation and children’s guts are linked: How parasitic worms and hot tubs may treat autism symptoms By Loren Grush Published December 12, 2013 Fox News. And Pasadena News reports Autism may be linked to gastrointestinal issues, Caltech study says By Adam Poulisse, Pasadena Star-News 12/06/13. Could these new studies reflect legitimate science? They consider the reports of parents about their own children. Is that legitimate? Oh, Deer, Deer, Deer. Next they will be telling us its all caused by vaccines. ……. What’s that you say? They already have? Where? Here? And what is the US Government and its Centers for Disease Control doing about this? A newly published paper of the Proceedings of the National Academy of Sciences of the United States of America makes the claim that the vaccine fails to prevent individuals getting the bacterial infection and fails also to prevent the disease being transmitted to other individuals: Acellular pertussis vaccines protect against disease but fail to prevent infection and transmission in a nonhuman primate model doi: 10.1073/pnas.1314688110 PNAS November 25, 2013. The authors suggest the previous “whole cell” vaccine did work and that the acellular vaccine does not. However, the “whole cell” vaccine caused large numbers of serious adverse reactions in children and had to be abandoned. What is notable about this is no claim is being made that the failure to achieve herd immunity and prevent the circulation of the disease is because of under-vaccination – as is claimed in the UK with measles cases in South Wales this year. Here it is being admitted that use of a vaccine does not create herd immunity. Despite these findings what is particularly bizarre is that instead of the authors suggesting research is needed into developing effective treatments for whooping cough, a basic childhood disease, and despite this new paper demonstrating 40 years of failure of vaccines in addressing whooping cough, they say we need improved vaccines. Well, the US FDA and the drug industry have had 40 years to prove themselves and this paper, if it can be believed, suggests they have failed. It is clearly time for a new improved and safer approach and especially one which does not kill or injure some children as vaccines do. The paper is by authors from the Division of Bacterial, Parasitic and Allergenic Products, Center for Biologics Evaluation and Research, US Food and Drug Administration [“FDA”], Bethesda, MD, 20892. However, it also states “Edited by Rino Rappuoli, Novartis Vaccines and Diagnostics Srl, Siena, Italy, and approved October 22, 2013 (received for review August 5, 2013)”. This illustrates the close relationship the US drug safety regulator, the FDA, has with the drug industry when as the safety regulator responsible for approving [or supposedly not approving] drug industry products it should have an “arms length” relationship to help maintain its independence.